One of the things I learned from watching Visual Acoustics was who John Lautner was. An off-hand comment from the movie was, "his homes are the ones the evil villains in movies live in." Which turns out to be true. It also turns out that I am now obsessed with John Lautner. 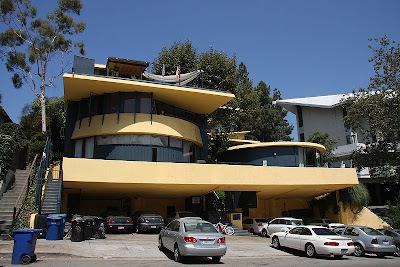 You can check out a full list of John Lautner's work here. I watched the Julius Shulman film you suggested, and I really enjoyed it. Now I'm fascinate with John Lautner's work too. Glad you enjoyed it. And glad there's another person out there fascinated with Lautner's buildings. They're just too interesting to ignore. Shulman did a great job capturing Lautners work. Im surprised you chose the image of the Sheats Apartment building its one of his lesser known works instead of the Sheats/Goldstein Residence or the Chemosphere.